The relationship between alcohol consumption and cardiovascular disease is complex and not fully understood. Risks associated with heavy drinking are well established, however there is conflicting evidence that shows benefits of drinking small amounts on one hand, and the risks of moderate consumption on the other. The results suggested that moderate drinking has a ‘protective effect’, although the risk of CHD and CVD is increased in former drinkers. 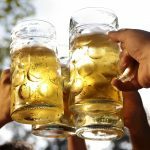 Heavy drinkers had a higher risk of initial presentation of coronary death, cardiac arrest, ischaemic stroke, intracerebral haemorrhage and peripheral arterial disease. However, heavy drinking was also associated with a lower risk of MI or stable angina as initial presentations. Former drinkers had an ‘augmented risk’ of unstable angina, MI, heart failure, cardiac arrest and ischaemic stroke as initial presentations, and occasional drinkers had an increased risk of MI, coronary death and heart failure. These results highlight the complexities and nuances of the link between different levels of alcohol consumption and CVD, and provide an excellent tool that will enable healthcare professionals to give better guidance and counselling for their patients.